Last week’s China-CELAC Ministerial Forum resulted in some noteworthy announcements from China, but the region’s formal inclusion in China’s Belt and Road Initiative (BRI) was not one of them. Chinese officials welcomed Latin America’s participation in the Initiative, generating considerable buzz about the region’s newfound place on the Belt and Road. However, Chinese officials stopped short of officially including Latin America and the Caribbean on their BRI map. The language employed by Foreign Minister Wang Yi during the Forum varied only slightly from already established narratives. Chinese officials referred to the region as a “natural extension” of the Maritime Silk Road, while adding that the region is an “indispensable participant” in the construction of the BRI. Although this language is suggestive of BRI-LAC linkages, no steps were taken by Wang Yi to formalize LAC participation, or, more importantly, to extend financing from the Silk Road Fund, a $40 billion investment fund established by China to make its Belt and Road ambitions a reality. At this point in time, Panama is the only Latin American country to have signed one of China’s over seventy Belt and Road Cooperation Agreements（一带一路合作协议）with individual countries, or to be featured on China’s BRI web site. As a result, Panama alone has entered into discussions with Beijing on BRI implementation in Central America. In January, Luis Miguel Hincapié, Panama’s vice minister of foreign affairs, held a meeting with Wang Xiaotao, vice minister of China’s National Development and Reform Commission, to discuss a feasibility study for the Ciudad de Panamá-David railway, which would connect Panama’s western Chiriquí province with the eastern Panamá province, allowing for both cargo and passenger transport. The Belt and Road nonetheless took center stage at the Forum—it was mentioned at least sixteen times during Foreign Minister Wang Yi’s opening remarks. According to Chinese Foreign Ministry reports, the Initiative was also discussed in some of Wang’s meetings with Latin American foreign ministers, including from Mexico, Chile, Bolivia, and Trinidad and Tobago. In addition, Wang’s five proposals for future China-LAC cooperation, made at the opening of the Forum, closely resemble the BRI’s “five links”—policy cooperation, infrastructure development, investment and trade facilitation, financial integration, and cultural and social exchange. Wang suggested building a transportation network “connecting lands and oceans,” with specific reference to bi-oceanic rail and tunnels. The Chinese foreign minister also mentioned facilitating trade through an import expo and other mechanisms, and broadening financial channels to “break developmental bottlenecks.” Exchange came up, too—through Confucius Institutes, on green development, and through the China-LAC Science and Technology Partnership and the China-LAC Young Scientists Exchange Program. And so, although LAC remains formally outside of the BRI, much of what China is proposing to do in the region is consistent with BRI’s stated objectives. 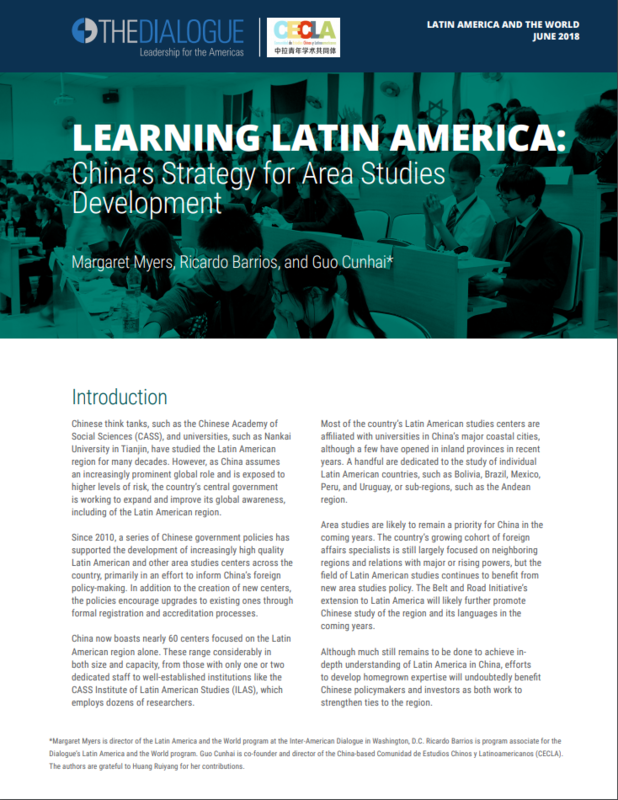 What is more, Chinese companies and banks have already pursued greater intra- and cross-regional connectivity through infrastructure in LAC for a number of years now. The list of proposed cross-country and cross-border transport deals is growing, although many, such as the Peru-Brazil Railway and the Belgrano Cargas Railway rehabilitation, have encountered setbacks. Others, such as the Mexico-Queretaro Railway, never quite made it off the ground. Though short on major announcements, the China-CELAC Forum reaffirmed China’s commitment to engagement with region, while emphasizing the various principles articulated not only in the BRI literature (see “Vision and Actions on Jointly Building Silk Road Economic Belt and 21st-Century Maritime Silk Road,” for example), but also in China’s recent Latin America-specific policies, such as the 2015 1+3+6 Cooperation Framework and the 2016 Policy Paper on Latin America and the Caribbean. The Forum’s three outcome documents—a Santiago Declaration (at least partially published here by the Vicepresidencia de Venezuela), a Special Declaration on the Belt and Road Initiative, and a Joint Action Plan for 2019-2021—will also underscore China’s aims. The Latin American and Caribbean region still isn’t an official stop on the BRI. But if China successfully achieves its policy objectives, the region needn’t feel left out. Latin American leaders should instead consider the many benefits and drawbacks of heightened infrastructure and other engagement from China. All would be well-advised to monitor outcomes along the actual Belt and Road. Next Next post: What Will Relations With China Mean for El Salvador?